Arctic Cooling presents the Freezer 64 Pro, a new AMD processor cooler that has a flexible mounting mechanism that allows you to install the heatsink in four directions. The cooler has a copper base, three double-sided 6mm heatpipes and 45 0.4mm aluminium fins that are cooled by a 92mm PWM fan that spins at 900 - 2200RPM. AMD Sockets FM1, AM3+, AM3, AM2+, AM2, 939 and 754 are supported. Pricing is $42.75 on the company's website, full specifications over here. 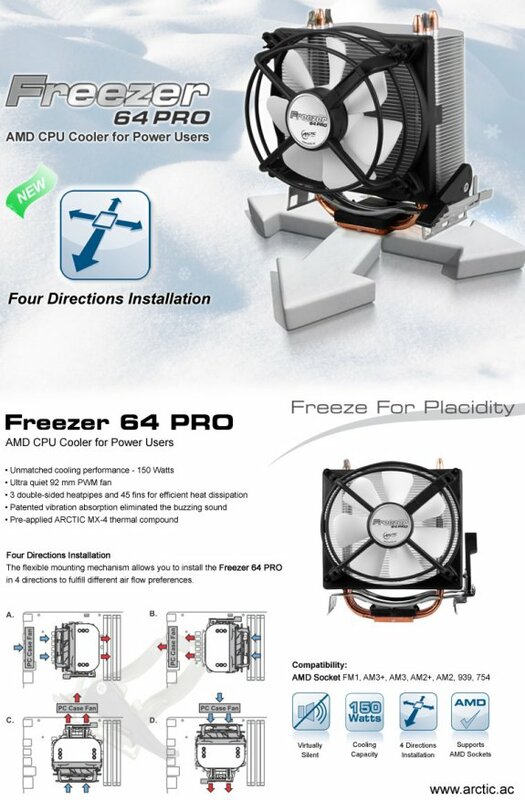 Freezer 64 PRO is a desirable replacement for your generic AMD stock cooler on account of the enhanced cooling performance and lowered noise level. With the upgraded flexible mounting mechanism, the cooler can be installed in four directions to fit your own air flow preference. The unique heatsink design of Freeze 64 PRO consists of 3 double-sided heatpipes and 45 aluminum fins providing an impressive efficiency in heat dissipation. Together with a 92mm PWM fan, the Freezer 64 PRO performs far beyond stock coolers and achieves 150 Watts cooling capacity. The flexible mounting mechanism allows you to install the Freezer 64 PRO in 4 directions to fulfill different air flow preferences. The mounting mechanism offers excellent stability and it is applicable within a few seconds. The pre-applied ARCTIC MX-4 thermal compound further supports a quick and clean installation.